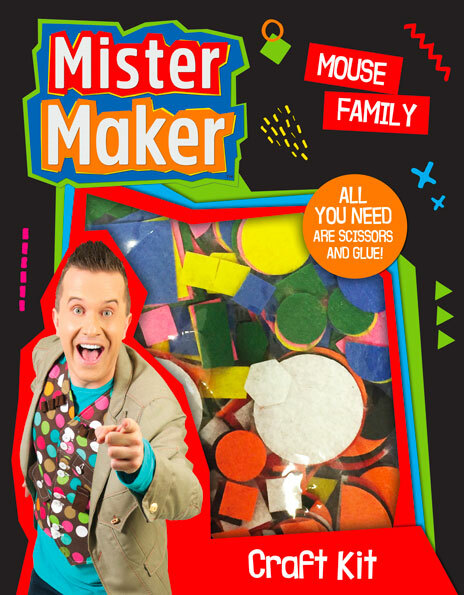 Join the fantastically popular, Mister Maker and make fabulous art projects. Each kit contains craft items and instructions to create amazing cards, puppets, jewellery, bookmarks and more! Make cute gift cards with Mister Maker! All you need are scissors and glue! Pack includes coloured card, sticky foam shapes, coloured markers and an instruction sheet. 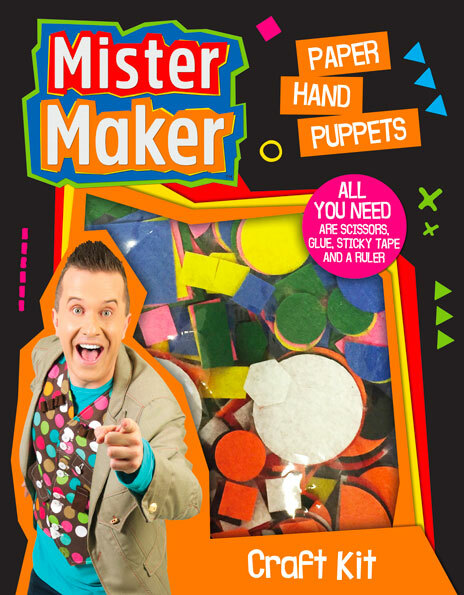 Make paper hand puppets with Mister Maker! All you need are scissors, glue, sticky tape and a ruler! Pack includes pom poms, googly eyes, feathers, coloured paper and an instruction sheet. 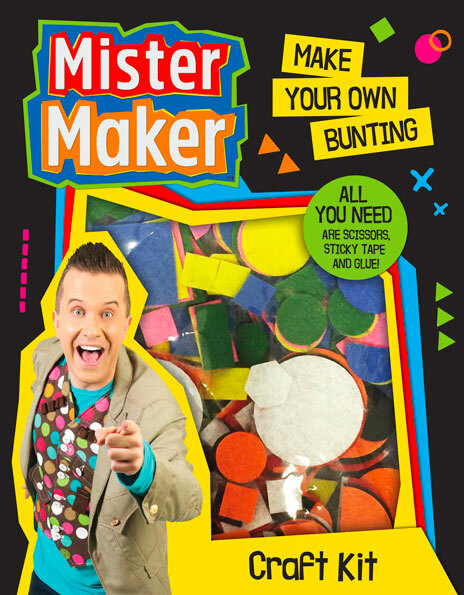 Make your own bunting with Mister Maker! All you need are scissor, sticky tape and glue! Pack includes coloured card, sticky foam shapes, ball of wool, glitter glue, sequin swirls, template and an instruction sheet. 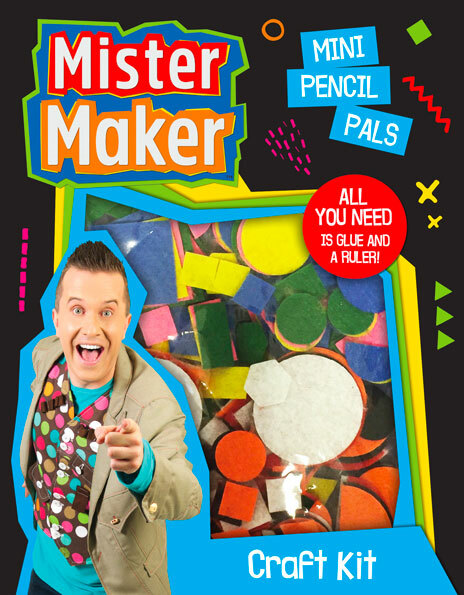 Make mini pencil pals with Mister Maker! All you need is glue and a ruler! Pack includes chenille stems, pom poms, threading pom poms, googly eyes, coloured pencils and an instruction sheet. Make cool craft jewellery with Mister Maker! All you need are scissors, glue and a pencil! Pack includes coloured paper, elastic, pom poms, threading pom poms, sticky foam shapes, wool, plastic safety needle, template and an instruction sheet. Make a mouse family with Mister Maker! All you need are scissors and glue! Pack includes coloured card, googly eyes, coloured markers, a black felt tip pen, wool and an instruction sheet. Make collage dinosaurs with Mister Maker! All you need are scissors, glue and a pencil! Pack includes tissue paper, googly eyes, sticky foam shapes, corrugated card, dinosaur templates and an instruction sheet. Make crazy creature bookmarks with Mister Maker! All you need are scissors, glue and a ruler! Pack includes chenille stems, pom poms, googly eyes, foam sheets, sticky foam shapes, template and an instruction sheet. Make an underwater mobile with Mister Maker! All you need are scissors, glue, sticky tape and a ruler! Pack includes chenille stems, coloured paper, wooden sticks, foam sheets, sticky foam shapes, ball of wool, googly eyes, template and an instruction sheet. 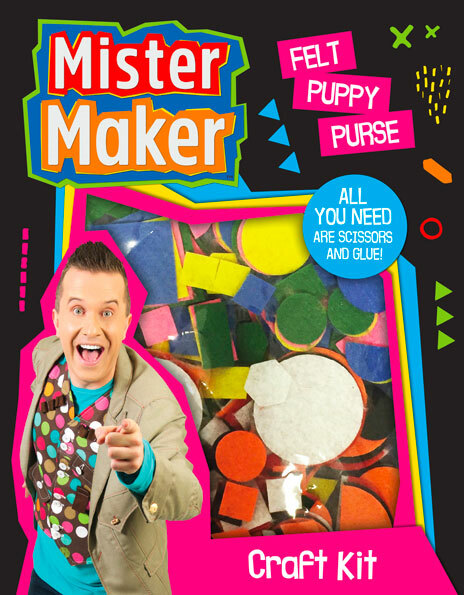 Make a felt puppy purse with Mister Maker! All you need are scissors and glue! Pack includes plastic safety needle, felt sheets, felt shapes, ball of wool, template and an instruction sheet.